トップ > JAMA > Effect of Meropenem-Vaborbactam vs Piperacillin-Tazobactam on Clinical Cure or Improvement and Microbial Eradication in Complicated Urinary Tract Infection: The TANGO I Randomized Clinical Trial. Question What are the comparative effects of meropenem-vaborbactam vs piperacillin-tazobactam for treatment of complicated urinary tract infection, including acute pyelonephritis? Findings In this noninferiority randomized trial that included 550 patients, the difference in the composite outcome of complete resolution or improvement of symptoms along with microbial eradication met the noninferiority margin of 15% when comparing meropenem-vaborbactam vs piperacillin-tazobactam (98.4% vs 94.0%). Meaning This study demonstrated noninferiority of meropenem-vaborbactam for the treatment of complicated urinary tract infection. Importance Meropenem-vaborbactam is a combination carbapenem/beta-lactamase inhibitor and a potential treatment for severe drug-resistant gram-negative infections. Objective To evaluate efficacy and adverse events of meropenem-vaborbactam in complicated urinary tract infection (UTI), including acute pyelonephritis. Design, Setting, and Participants Phase 3, multicenter, multinational, randomized clinical trial (TANGO I) conducted November 2014 to April 2016 and enrolling patients (≥18 years) with complicated UTI, stratified by infection type and geographic region. Interventions Eligible patients were randomized 1:1 to receive meropenem-vaborbactam (2g/2g over 3 hours; n = 274) or piperacillin-tazobactam (4g/0.5g over 30 minutes; n = 276) every 8 hours. After 15 or more doses, patients could be switched to oral levofloxacin if they met prespecified criteria for improvement, to complete 10 days of total treatment. 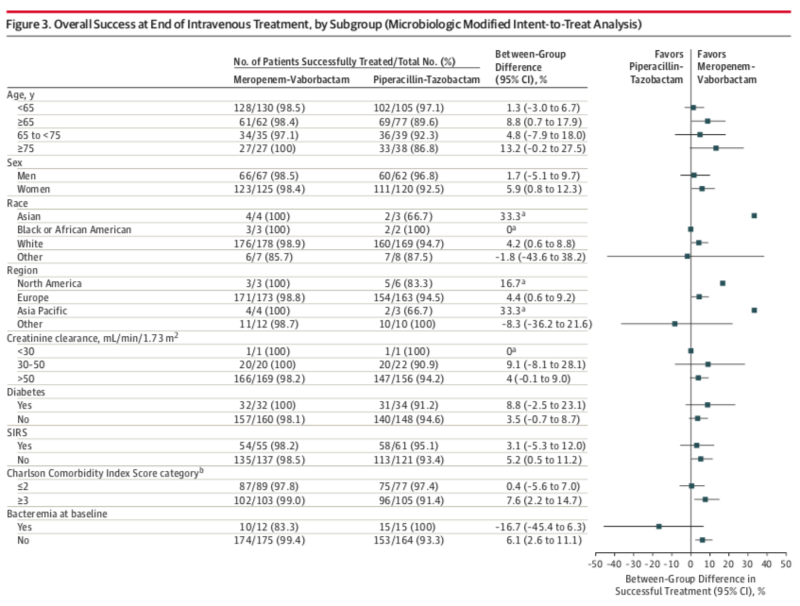 Main Outcomes and Measures Primary end point for FDA criteria was overall success (clinical cure or improvement and microbial eradication composite) at end of intravenous treatment in the microbiologic modified intent-to-treat (ITT) population. Primary end point for European Medicines Agency (EMA) criteria was microbial eradication at test-of-cure visit in the microbiologic modified ITT and microbiologic evaluable populations. Prespecified noninferiority margin was −15%. Because the protocol prespecified superiority testing in the event of noninferiority, 2-sided 95% CIs were calculated. Results Among 550 patients randomized, 545 received study drug (mean age, 52.8 years; 361 [66.2%] women; 374 [68.6%] in the microbiologic modified ITT population; 347 [63.7%] in the microbiologic evaluable population; 508 [93.2%] completed the trial). For the FDA primary end point, overall success occurred in 189 of 192 (98.4%) with meropenem-vaborbactam vs 171 of 182 (94.0%) with piperacillin-tazobactam (difference, 4.5% [95% CI, 0.7% to 9.1%]; P < .001 for noninferiority). 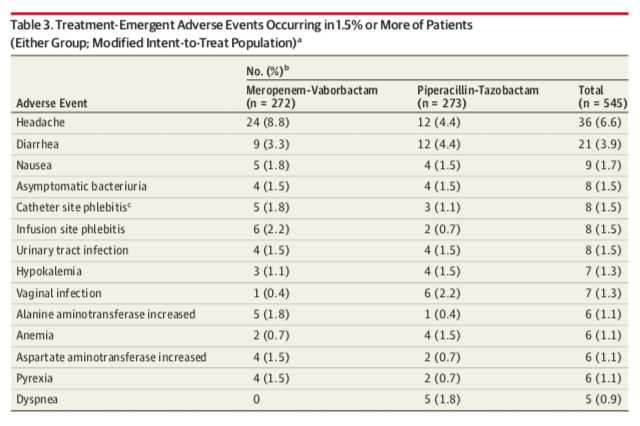 For the EMA primary end point, microbial eradication in the microbiologic modified ITT population occurred in 128 of 192 (66.7%) with meropenem-vaborbactam vs 105 of 182 (57.7%) with piperacillin-tazobactam (difference, 9.0% [95% CI, −0.9% to 18.7%]; P < .001 for noninferiority); microbial eradication in the microbiologic evaluable population occurred in 118 of 178 (66.3%) vs 102 of 169 (60.4%) (difference, 5.9% [95% CI, −4.2% to 16.0%]; P < .001 for noninferiority). Adverse events were reported in 106 of 272 (39.0%) with meropenem-vaborbactam vs 97 of 273 (35.5%) with piperacillin-tazobactam. 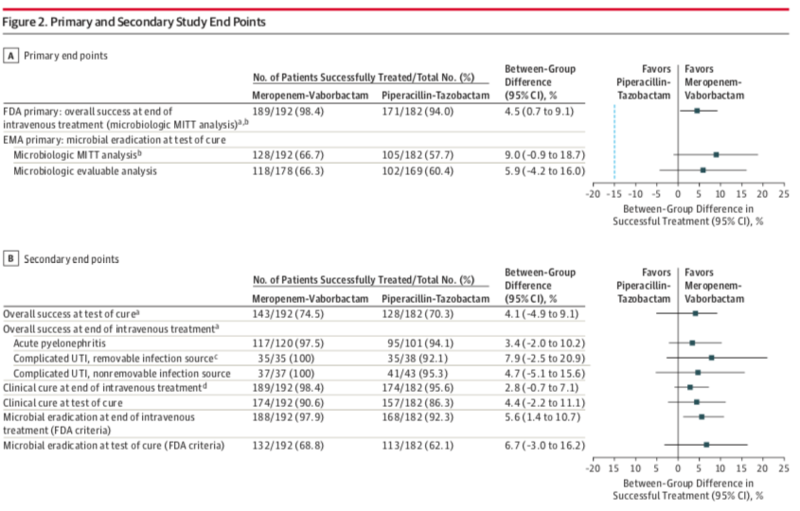 Conclusions and Relevance Among patients with complicated UTI, including acute pyelonephritis and growth of a baseline pathogen, meropenem-vaborbactam vs piperacillin-tazobactam resulted in a composite outcome of complete resolution or improvement of symptoms along with microbial eradication that met the noninferiority criterion. Further research is needed to understand the spectrum of patients in whom meropenem-vaborbactam offers a clinical advantage.